The Cressi Atlantis Wetsuit for Women is a 7 mm semi-dry wetsuit made from a premium ultrastrech neoprene. This one piece wetsuit is ideal for cold water temperatures of 7-12°C (45-54°F). 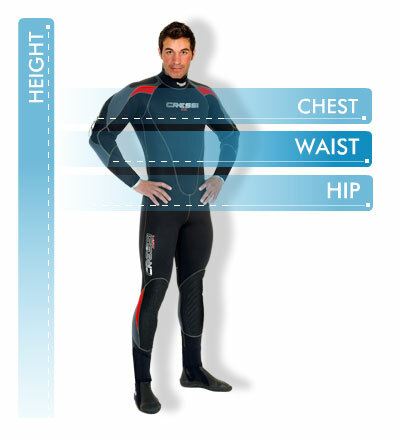 The Cressi Atlantis is the ideal wetsuit for cold water dives. Its anatomical cut, the watertight back TiZip fastener and the Ultrastretch material guarantee freedom of movement underwater and make putting the suit on, and taking it off, quick and easy. The watertight plastic TiZip fastener is positioned at the back, from shoulder to shoulder, making the suit easy to put on and take off and ensuring a high level of comfort when fastened. The seals at the wrists and ankles have double cuffs which allow gloves and footwear to be fitted between the cuffs’ two thin layers of neoprene, thus reducing water infiltrations to a minimum. The suit offers a tailored and anatomical fit and its pre-shaped arms and legs aid the natural position of the limbs. The knee and shin area and the shoulders have large anti-wear inserts.